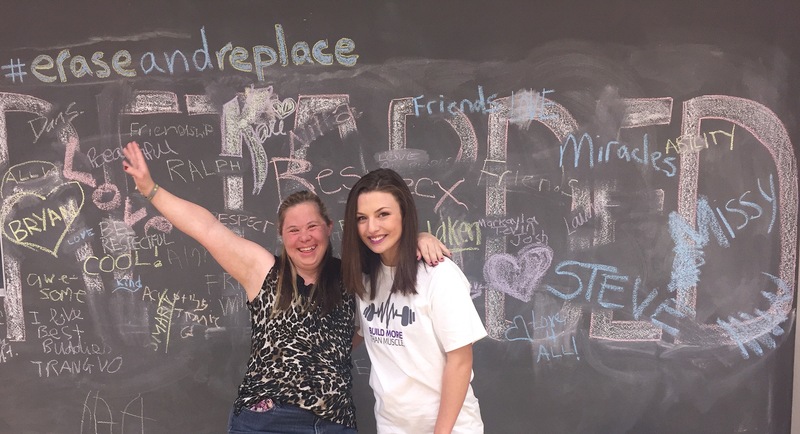 Belmont’s Best Buddies Chapter, an organization that pairs Belmont students with people with intellectual and developmental disabilities in the community, was recently nominated for six state-wide awards. The Chapter went on to win five of those awards including College Chapter of the Year for Tennessee, allowing the Chapter to be eligible for international chapter of the year. The students also won Buddy Pair of the Year, Ambassador Speech of the Year, College Chapter President of the Year and Event of the Year for the chapter’s Music Festival, an event held in the Beaman Student Life Center where members of the Belmont and Nashville community were invited to a night filled with musical talent and entertainment. The event, pictured to the left, was the group’s final event last semester. Bands played and sang alongside the chapter’s community buddies. Belmont’s Chapter Faculty Advisor Dr. Sally Barton-Arwood said the group’s student members are incredibly committed to spending time with their buddies. With outings each month, students arrange one on their own — ice cream, trips to the mall, etc. — and the second is done as a larger organization. Story published in partnership with Best Buddies Tennessee.